← Holy Moses, It’s a New Class! 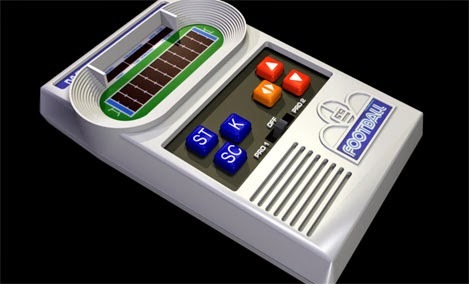 I saw the picture of electronic football game and my thumb began to have memory pain from the hours and hours I smashed those buttons. I've already found a version for my phone … with passing! Ottumwa? Did you ever go to Spud's Emporium when it was open? Well…I'm from Minnesota…but, root for…Marines? Dunno if I can do it. I had that game as a kid. But there was a pattern that could get you a TD, every time. Doesn't ring a bell – I'll ask my folks. I do know the Canteen and Graham's very well, though. Too well. If I learn that pattern, I'll be running a fantasy arena football league. Don't they have rotisserie league football already? I know they have baseball. Lots of fantasy football around, but not quite the same as what I'm doing.